North to .... New York ??? A new start – heading into the unknown – again. Our PCT hike was a good one, just much too short. 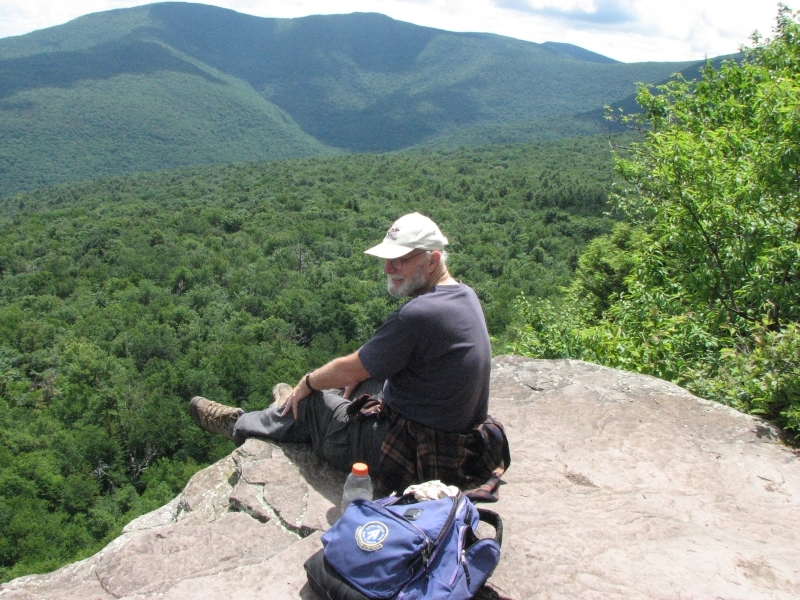 After about 400 miles on the trail, Jim tore the meniscus in his right knee. He woke up one day utterly unable to walk. The same thing happened to him in 2005, so Jim knew what it felt like and what the cure was. We returned to Maryland where he had arthroscopic surgery to fix the problem. A week later, we packed up the truck and took off again. For six weeks he'll need to take it easy, but the doctor told him it was safe to keep hiking. Now that the doctor has given us the all clear, we’re heading north for the summer. We have no fixed plans; instead we’ll once again just make it up as we go. The past several years have been spent exploring the mountains and deserts in the west. 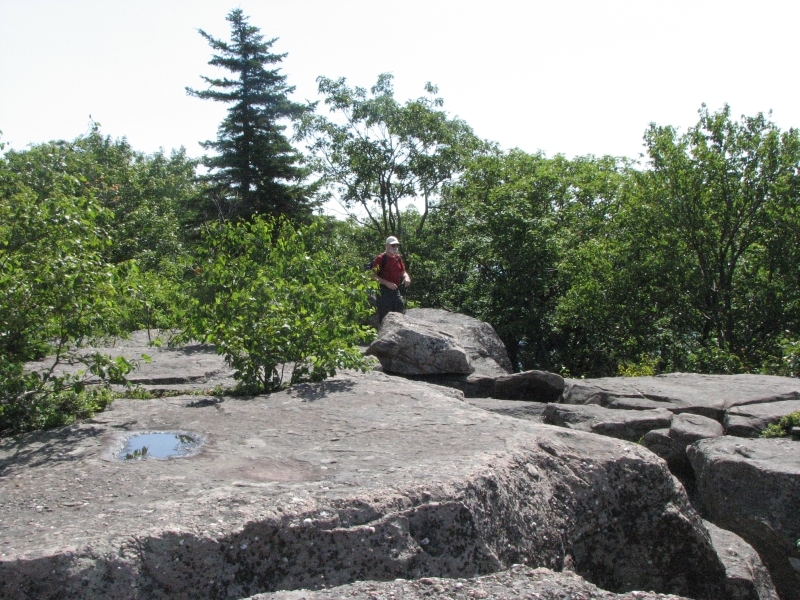 However, I’ve never spent any time in the mountains of New England except during my Appalachian Trail thruhikes. My only visit to eastern Canada was our brief stop at Niagara Falls last autumn, though there are several parts of the Canadian Maritimes that I really wanted to see someday. There are a lot of interesting and beautiful wild areas along the coast and in the mountains that I would like to explore as long as we have the opportunity. Looks like this is it. We originally intended to head straight to Canada, until Jim noticed – the day before we left -- that my Passport had expired in April. Oops! 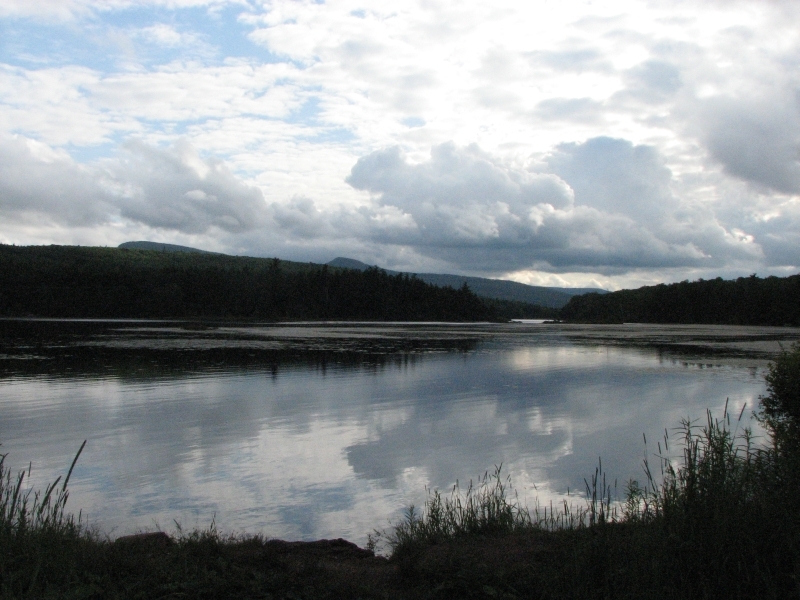 So we decided to wander through New York and New England until the passport is renewed, and if there’s time, we’ll continue our journey into the Canadian Maritimes as we intended. When I first learned about the passport problem, I was really upset by yet another change of plans. It has been so frustrating to have so many of our plans overturned the past few years. Yet I know everything will work out in the end. It always does. We have enjoyed our travels the past few years, even though we had little idea when we set out on our journeys what we would discover along the way. I am sure that this year we will again find amazing and unexpected beauty in places that we can’t imagine right now. So once again we will see where the wind blows us. 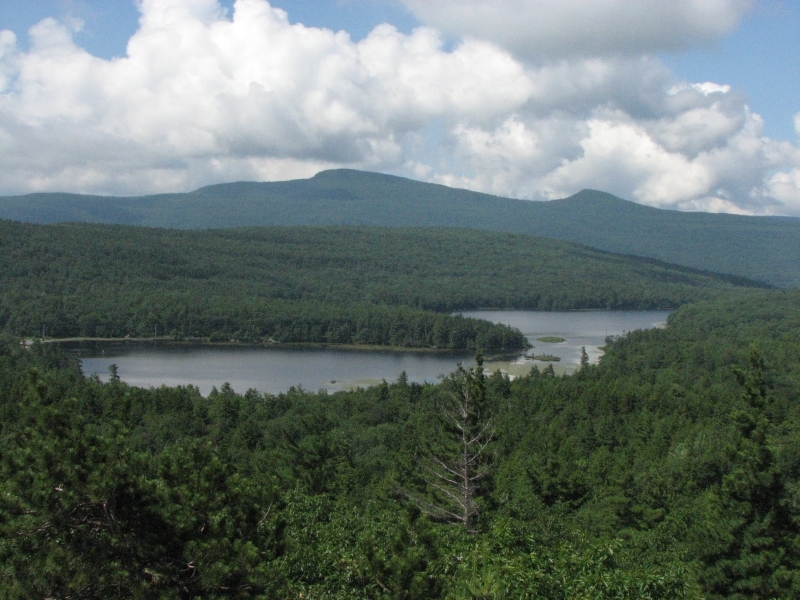 Our new plan for the immediate future is to go to New York State to explore the Catskills and Adirondack mountains. 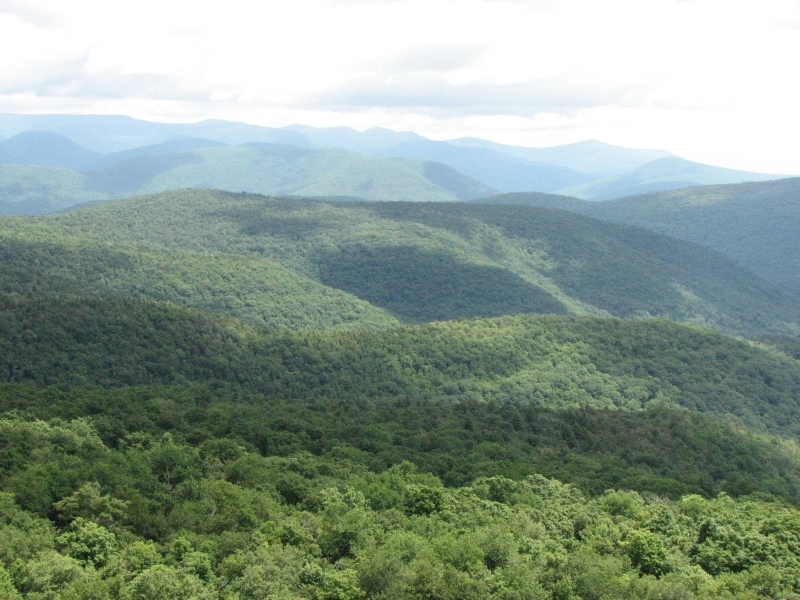 I’ve never been to the Adirondacks, and only hiked a couple of times in the Catskills when we lived in Pennsylvania several years ago. We can’t do much hiking yet, but we can camp and do short walks while Jim heals. His surgeon told him that the best therapy for his knee is to go walking, just not too much too soon. As for today, we followed a back-roads route through Maryland horse country and Pennsylvania fruit orchards to Pine Grove Furnace State Park. 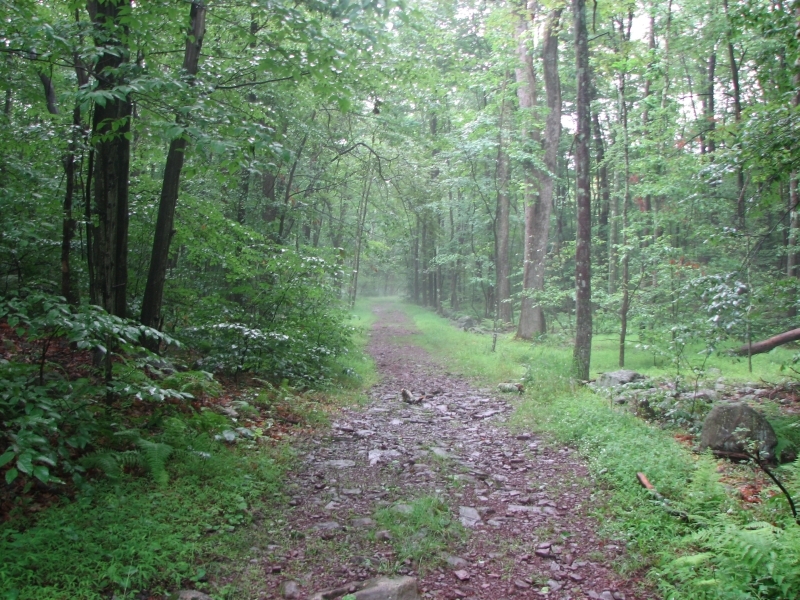 We have been there several times as it is near the half way point of the Appalachian Trail. 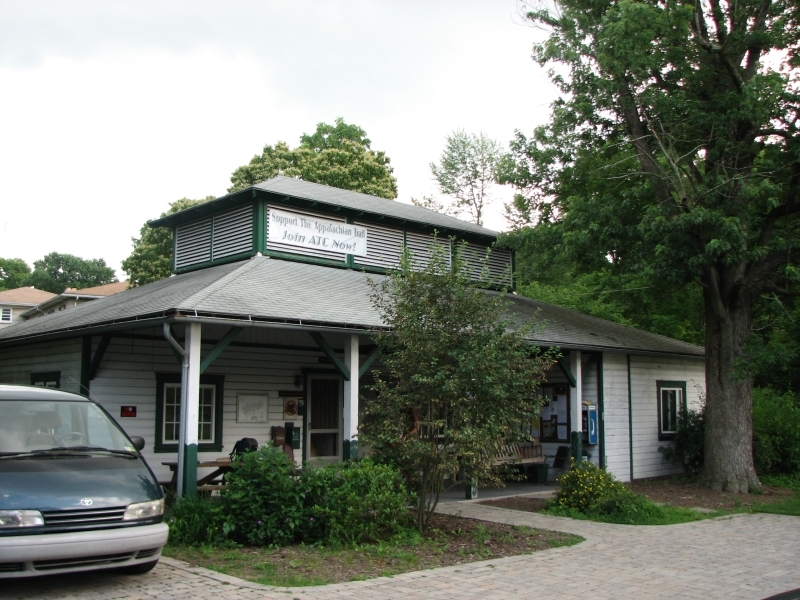 It’s a pretty area, with a nice section of the Trail and an interesting and historic hostel that we have visited several times. Today there were a lot of AT thruhikers at the store, more than I expected. When we thruhiked, we were much farther north on July 1, and since so many hikers start hiking earlier than we did, I thought the herd would be in New York by now. A few thruhikers were eating their half gallon of ice cream while we were there, an AT tradition for the half way point. We talked to a couple of hikers for a while, then drove out to the campground where I did a short walk before settling into the back of the truck to read. We enjoyed a leisurely day today, sleeping late, walking up the Appalachian Trail along the creek at Pine Grove Furnace, stopping at Boiling Springs to check out the ATC Regional Office, then walking a short distance at Big Trees Conservation Area. They have planted blight-resistant chestnut trees there, but the hiking trails through the woods aren’t mapped, so we had no idea where they went. Jim and I turned around after 20 minutes or so rather than get lost in a strange place. 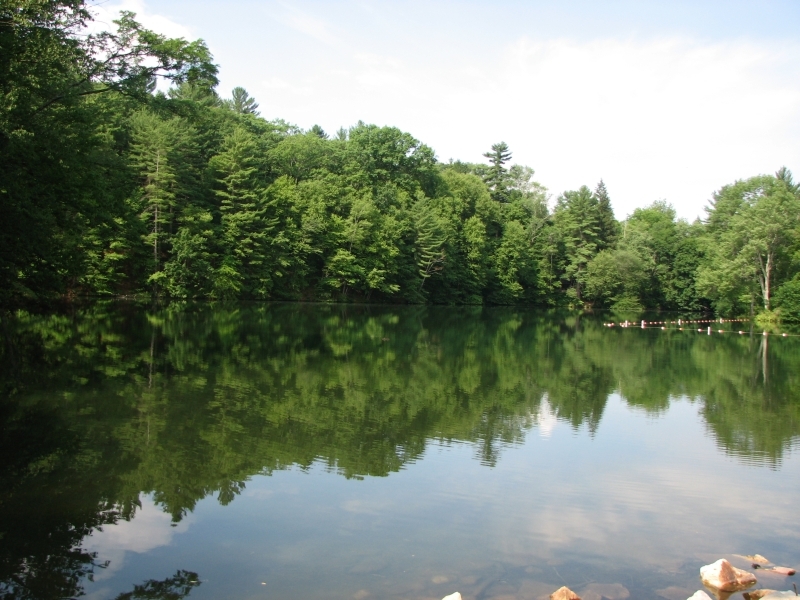 We found a quiet campsite at Hickory Run State Park and went for our third walk of the day to a small lake with a swimming beach and a short nature trail. We saw a couple of deer while walking and another on the road, as well as a falcon and another larger hawk and several vultures. Dinner was a huge cheese-steak at a nearby Italian restaurant, then we came back to a cool shower at the bathhouse. All in all, a good day. My moodiness of yesterday has passed. I’m willing to go with the flow, wherever it leads us. Life is good and I can’t complain. We spent the past few days with good friends Beau and Ninon in Monticello, NY. Ninon is the priest at St. John’s Episcopal Church. We intended to stay only one day, but their welcome was so warm, we ended up staying four nights. We did a lot of talking. Beau lives at the parish house next to the church while Ninon lives in her own house a few miles away. We stayed with Beau, sleeping on the floor of the office in the parish house. On Friday, Jim and I went for a walk in a nearby park. It was only a mile or so, but it felt nice to get out in the woods again. On Saturday we attended a picnic with a live band hosted by a friend of theirs who was recently diagnosed with inoperable cancer. She wanted to give a big party as a sort of farewell to her friends. I thought that was a terrific idea. There was lots of great food and I enjoyed the music – 60’s rock and roll. On Sunday we went to church, then to a farmer’s market, then lunch with Beau, Ninon, and Joan, a friend of theirs who is also a priest. We sat at the restaurant for hours talking. Friday the weather changed from wet to wonderful and we’ve enjoyed sunshine since we arrived. Monticello is an odd town, a former tourist town, now run down and with numerous empty shops and very little money. It’s become basically a Hassidic summer resort. Evidently the resorts are legally religious retreats, thus not taxable property, so the entire tourist tax base is gone and the town is suffering financially. I really enjoyed our visit with Beau and Ninon. They are such incredible people, warm and generous. Between the two, they have nine beautiful Samoyeds. We met several friends and parishioners, between the picnic and church service. It was an unusually social time for us, and I enjoyed it. 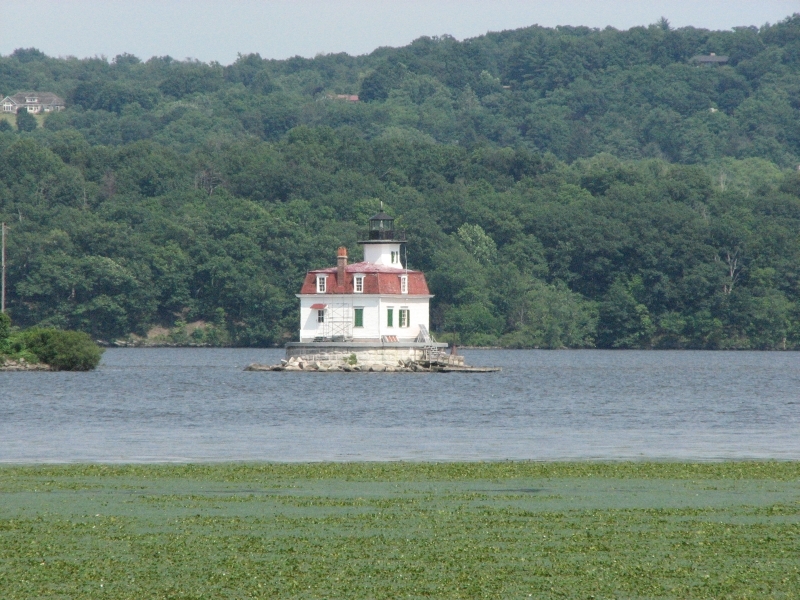 Today we ate a leisurely brunch with our friends at a diner, then headed east, across the Hudson River. We had ice cream for lunch, after driving downstream along the river. There were some beautiful houses near the river and some nice views of the water. We headed to a small park that is supposed to have petroglyphs. We arrived just at closing time, but the ranger stayed a few minutes late to get us a campsite for the night in the nearly empty campground. 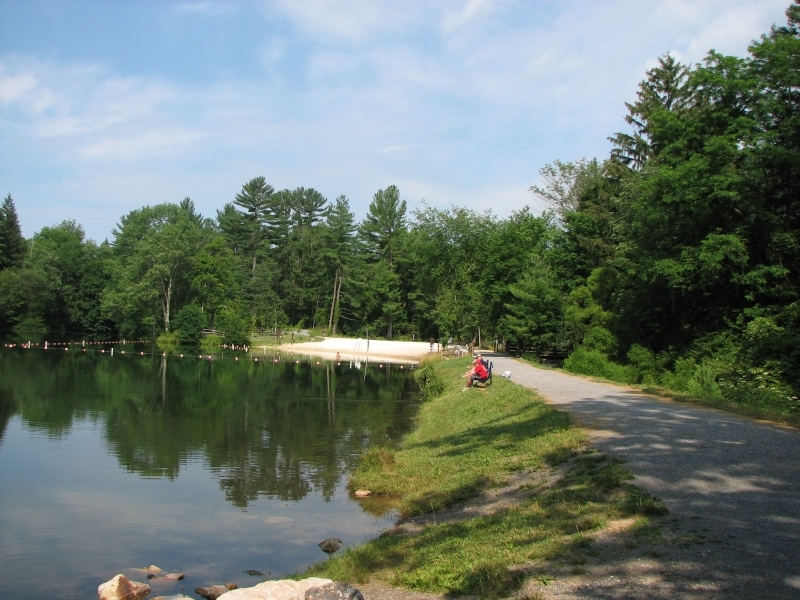 They have 20 Adirondack-style shelters in the park and a few tent sites, but no RV sites. The ranger told us we could park the truck at one of the tent sites. Bathrooms are far apart and primitive, and there’s no water, but I like the campground. 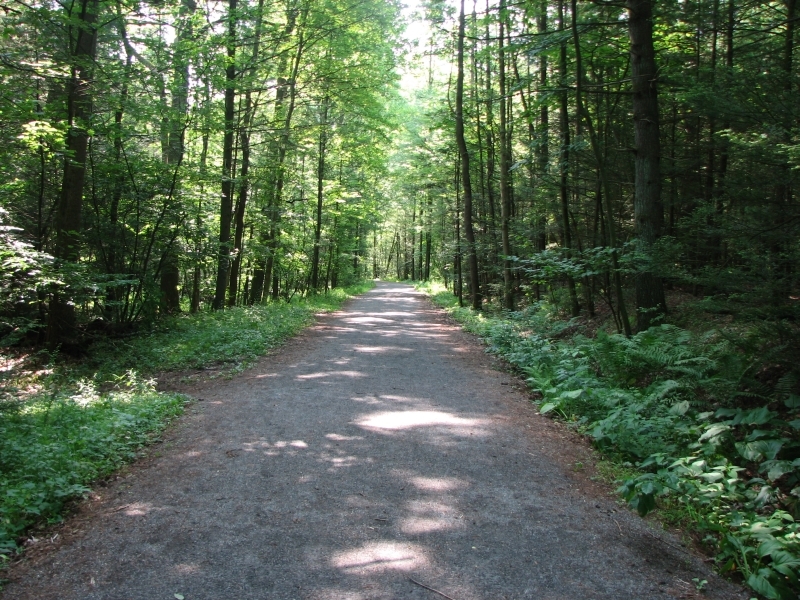 There is quite a bit of hiking on old roads through the woods, lined with stone walls. Our campsite overlooks a lush green meadow. 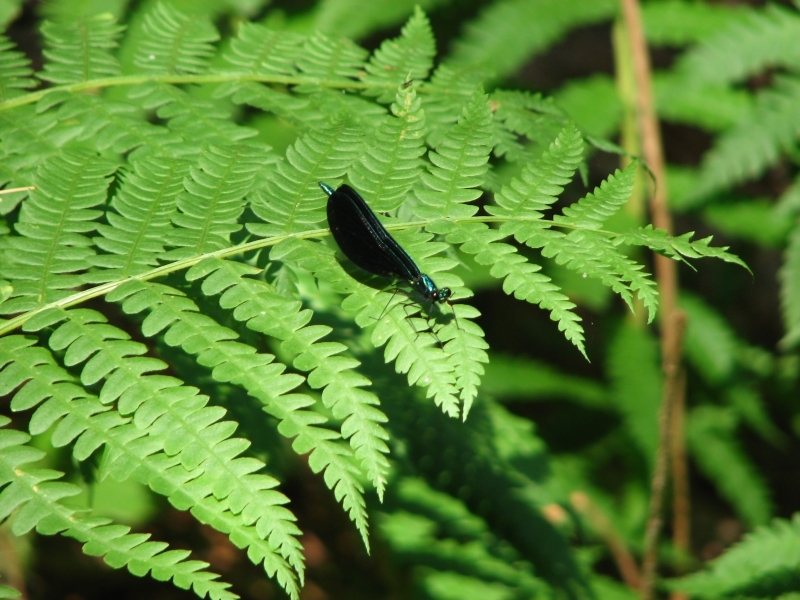 Mosquitoes are hungry and the no-see-ums are voracious. Fortunately, the windows in the back of the truck are screened, so we can read in peace. This morning Jim and I hiked a nice four mile loop through Ward Pound Ridge Nature Preserve and found the petroglyph we were looking for: a bear on its back. It was probably fairly modern, but still an interesting image. 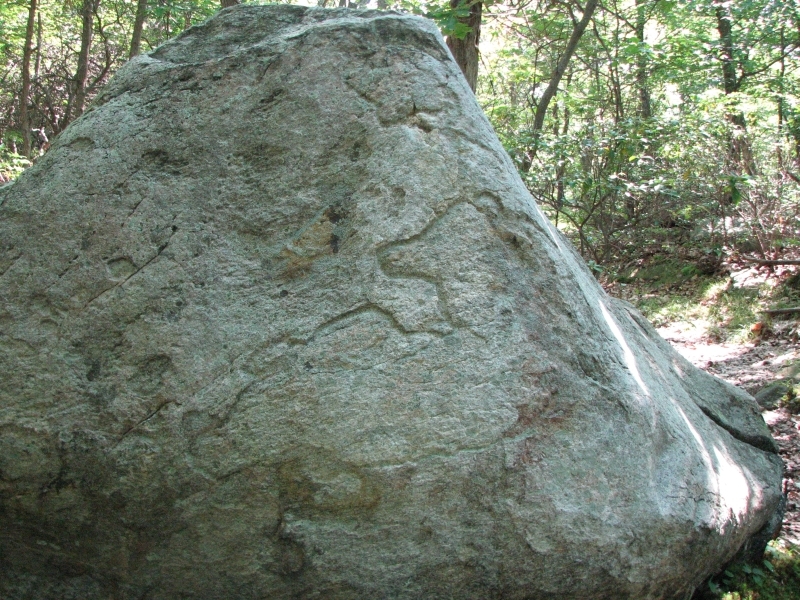 There was another petroglyph on a rock outside the nature center: a circle and a triangle. Were they authentic? No way to know. I enjoyed the walk in the woods, regardless. 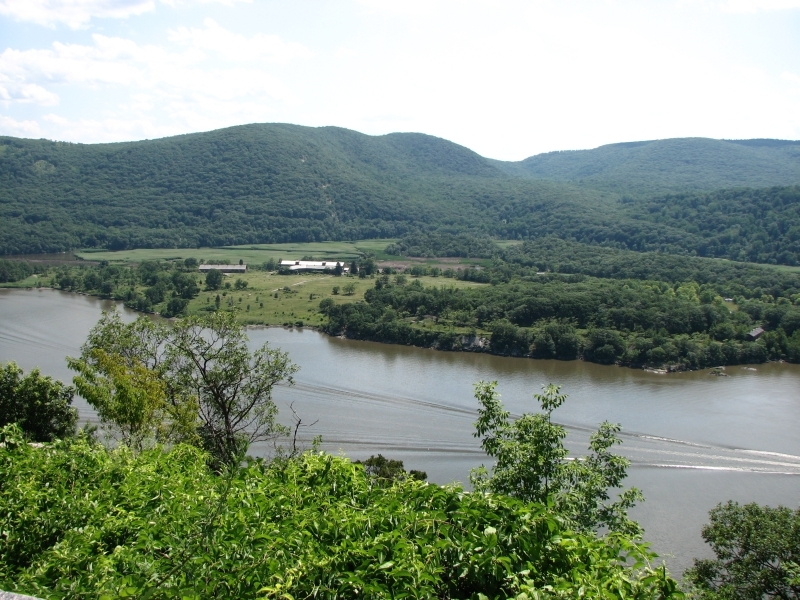 We drove up the west bank of the Hudson River and stopped to look for another petroglyph site near Esopus, but Indian Rock wasn’t obvious and none of the people we asked locally knew where it was. The woman at the Historic Society directed us to a beach area that she thought might possibly be the site, but she admitted she had no clue where the rock actually was located. We didn’t find it. Finally, we ended up in Kingston at a motel where we took a very welcome (and overdue) shower. Thunderstorms came in waves all afternoon: one while we stopped for lunch at a rest stop and several others while we were in the motel. We really weren’t in the mood to camp in such uncertain weather. Today we left the motel late, then wandered around town checking out the many used bookstores in Kingston. We finally did laundry since Jim was running out of t-shirts. It was 5:00 by the time we left town, so we only drove an hour or so to a state campground where we found a nice flat site in the woods. It sprinkled off and on, but not too seriously. 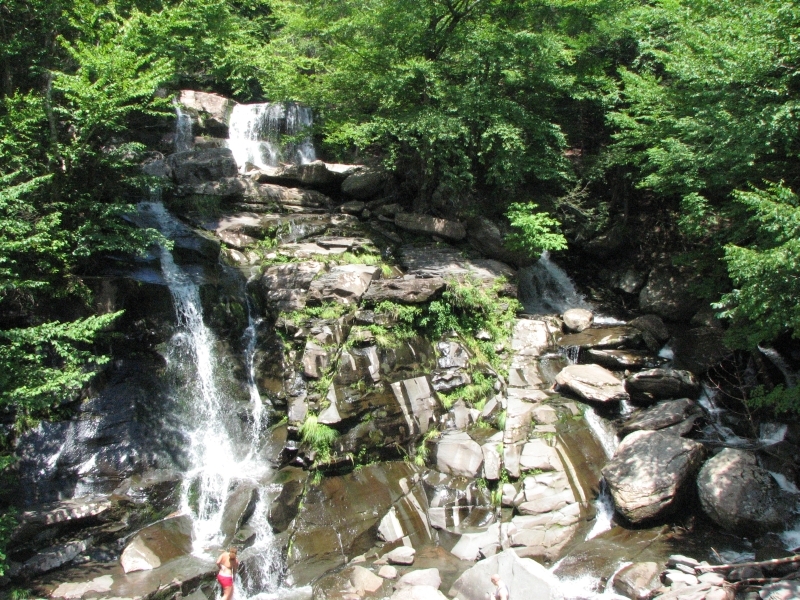 Another leisurely day, wandering through the Catskills. We did a short steep hike to Giant Ledges, where we had nice views over Slide Mountain Wilderness with its rolling green hills. The trail was steep and rocky, so slow going, especially on the descent, but it was fun. 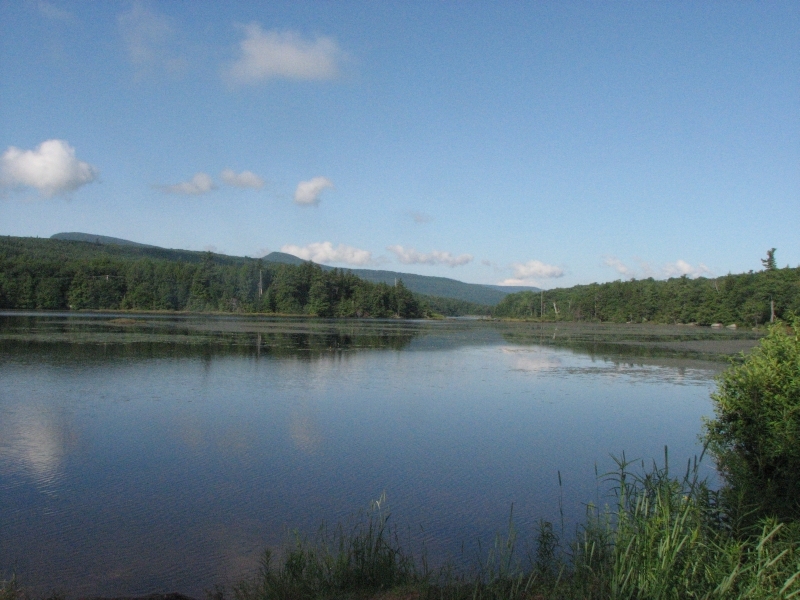 Then we drove to the northeast corner of the Catskill Forest Preserve to North-South Lake. We lucked into a campsite right on the lake. It was very peaceful eating our grilled burgers, sipping beer and watching the kayaks and fishermen out on the water. I did a short walk to the site of an old hotel. There was sort of a view east to the Hudson, but it was hazy. 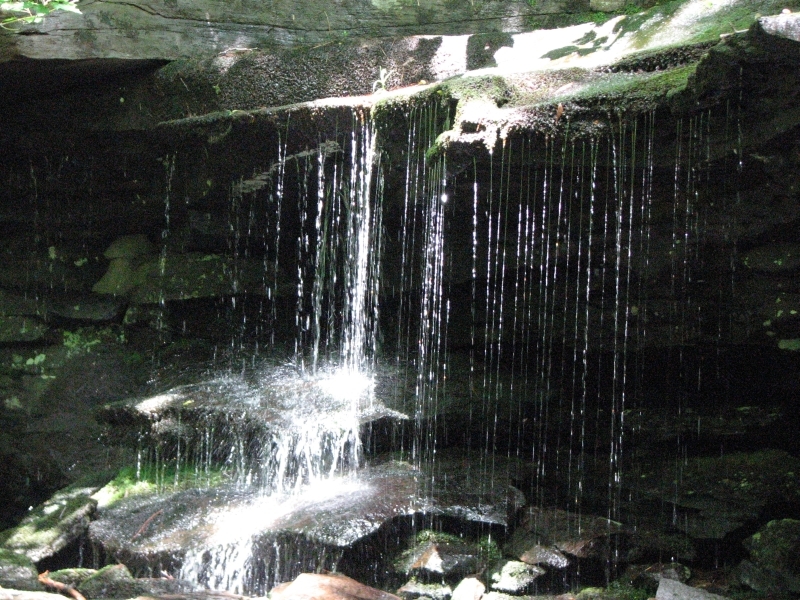 I liked the dripping spring though. We saw deer and a family of turkeys along the road. After supper we indulged in a hot shower, a good one for once, hot and powerful. Jim and I plan to meet a couple of friends on Saturday at RPH Cabin on the Appalachian Trail, hence our leisurely journey. There is a work trip and hiker feed planned for this weekend, so it makes a good place to meet. Jim didn’t want to head north to the Adirondacks and then turn around and race back, so we’re doing small circles in southern New York instead. Jim’s leg hurt with the long hike yesterday and the steep one today, but he says it is feeling better. I feel like we’re just marking time right now, waiting for the main event. It is enjoyable driving through new country, looking at the pretty Victorian houses, the rivers and forests and fields, but New York is too developed to really appeal. 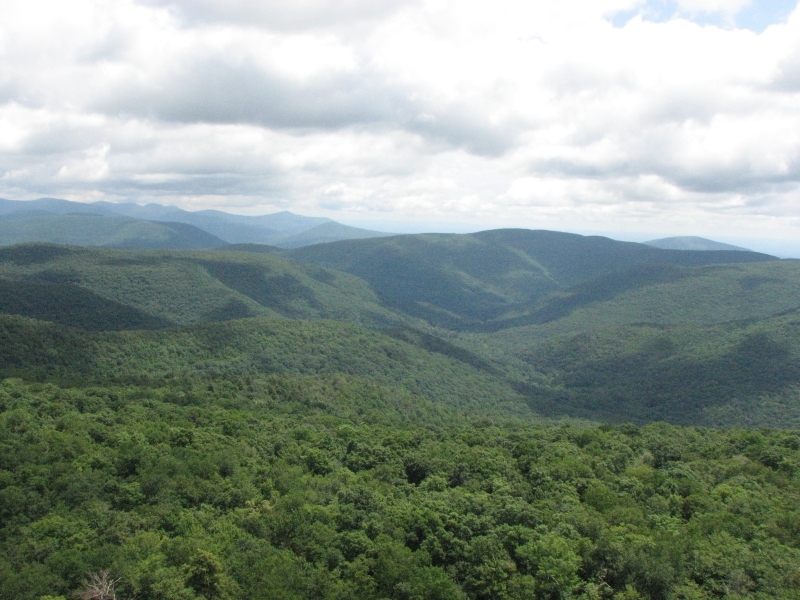 The Catskills at least do have some space between the towns, some areas that are empty of houses. I need that space right now. Seeing all the towns south of here, the traffic and crowded places, made me yearn for the wide open spaces out west. I’m really ambivalent about living in the east. Yes, no, maybe. We’ll decide later. I want a home, but I’m not ready to make a choice yet. Montana, Utah, or Pennsylvania? Living in the east means being near family. Living in the west means living near magnificent mountains and deserts. I can’t decide. Today was a waterfall day, with some nice hiking in and around North South Lake. First we climbed up to some flat rock ledges with a nice view known as Artist Point, with hazy views east toward the Hudson River, then we scrambled up to more rocky ledges, Sunset Rocks, with good views toward the lakes. 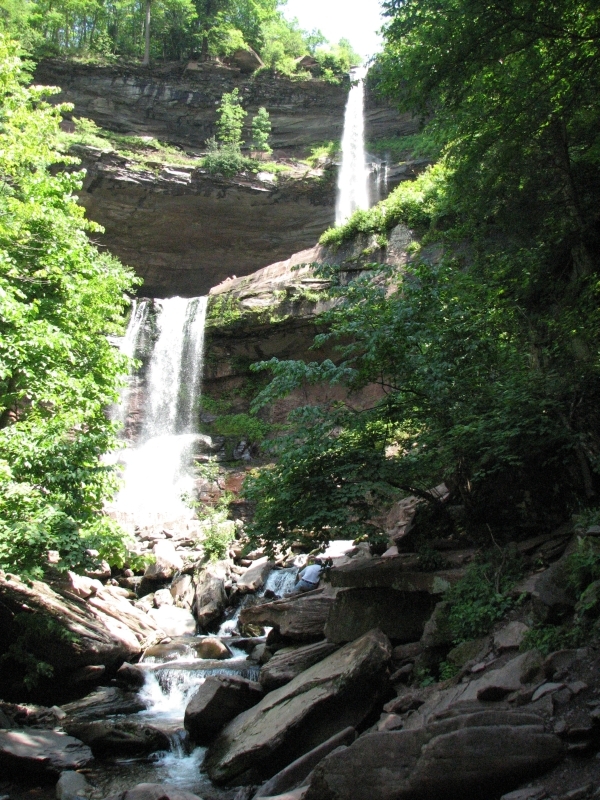 We continued to climb, sometimes steeply, to another eastern viewpoint, Newman’s Ledge, then we dropped gently through dense hemlocks to Mary’s Glen and a small lacy waterfall followed ½ mile later by larger two-tiered Ashley’s Falls. A brief walk on the road brought us back to the car. 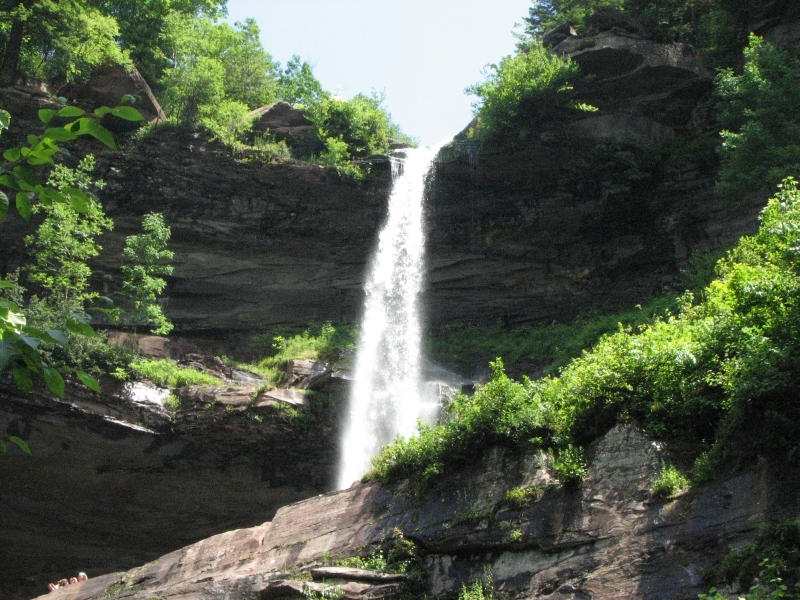 Although parts of the hike were steep and all of it was rocky, Jim was game to do another short hike (after a sandwich and ice cream) to New York’s tallest waterfall, Kaaterskill Falls. It was beautiful, dropping 260’ in two tiers. 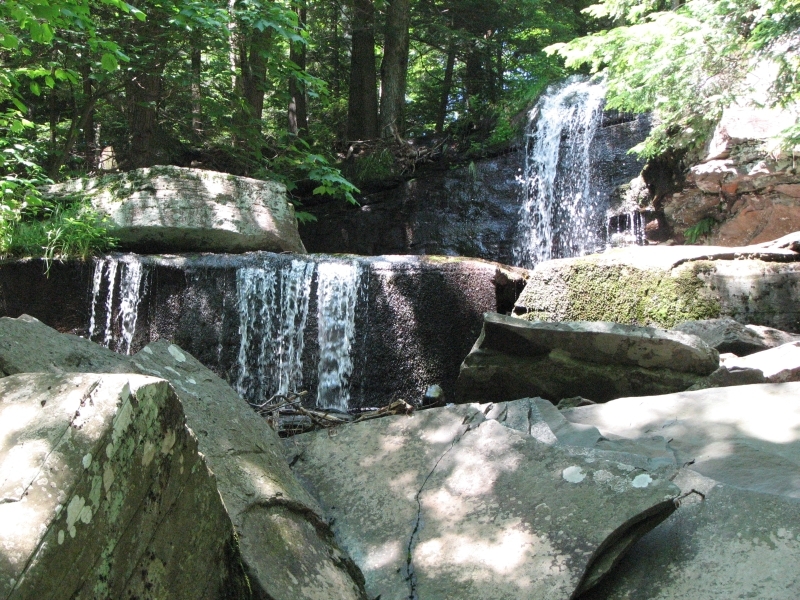 At the trailhead we passed another beautiful waterfall called Bastion Falls. There were a lot of people climbing the stone steps, but it was well worth the effort. After a stop to stock up on groceries, we headed east to Connecticut. I enjoyed our two short hikes today. 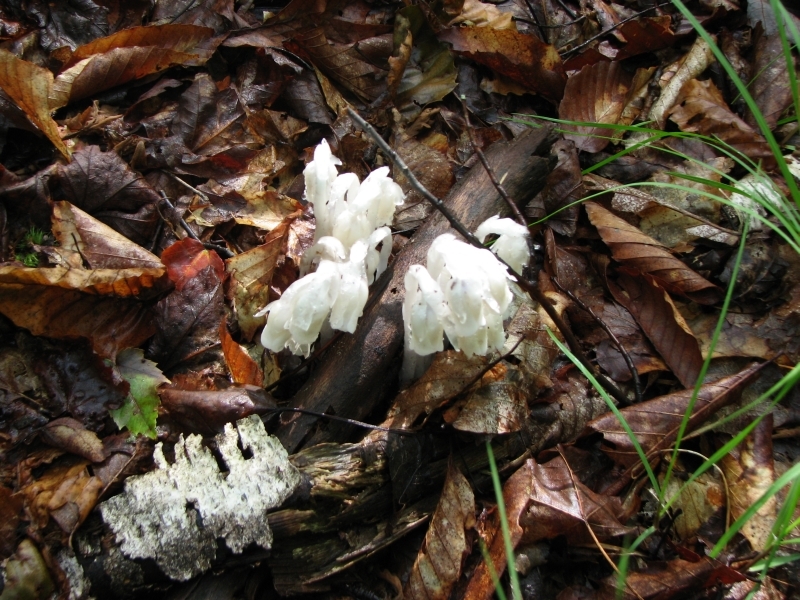 The sun shone, but the day was cool – in the mid-seventies – and the hemlock forest was dark and shady. Our drive gave us nice views of the Catskills to the west, the broad Hudson River, flower-filled meadows, huge old houses, etc. After a futile stop at one State Park whose campground was full, we ended up at a campground near Bulls Bridge, Connecticut. The shower was hot (a nice change), but otherwise the campground wasn’t very appealing, since our site was in an open treeless section. Still, it was quiet. A change of pace. 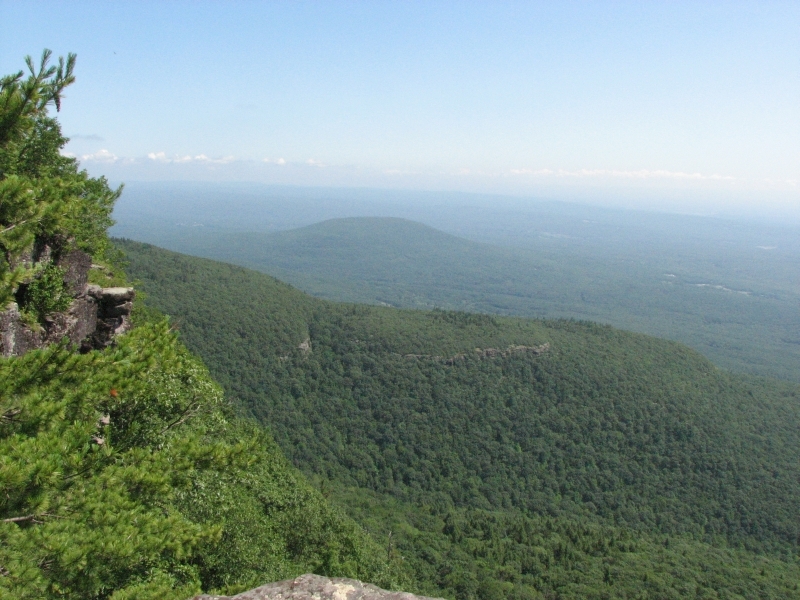 We heard that a couple of friends would be participating at a work weekend/hiker feed on the AT at RPH Cabin in New York. We stopped for brunch in Kent, purchased more books at a library book sale, checked email at the library, then drove back to New York. We weren’t sure how to find the hostel, since we’ve only walked there in the past, not driven, but eventually we stumbled on the right road off the Parkway. Our friend Mark was working on some steps up the trail, so we said hello to a couple of other people we knew, searched out the work crew, followed them to another site a mile and a half away, and helped move rock and dirt for a waterbar. When that task was more or less done, everyone returned to the cabin where we enjoyed a delicious steak dinner with several thruhikers and the work crew, then Jim and I slept in the back of the truck while it rained and thundered. Sunday morning our friend Dave arrived. 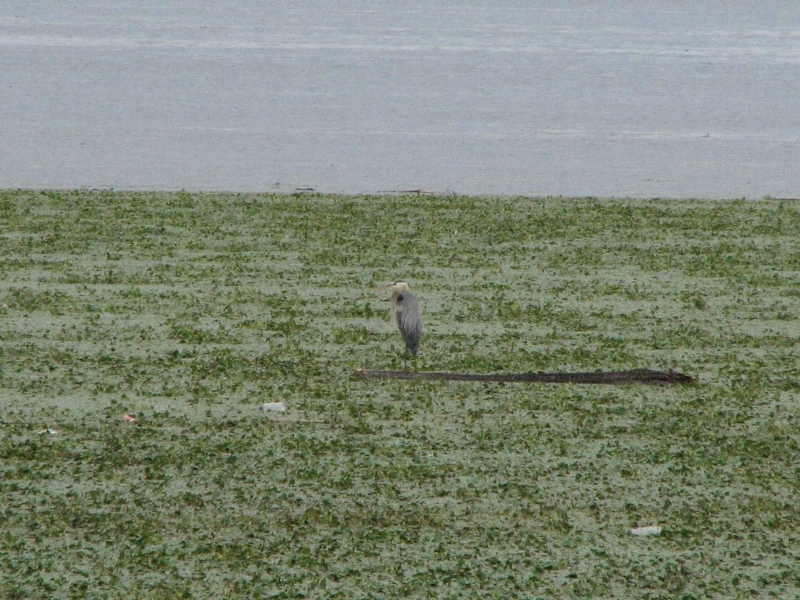 We talked with him while breakfast was being cooked, then he headed back up the trail to build more waterbars. Jim didn’t want to climb the hill again–his leg was hurting–so we got the job of scrubbing green mold off the cabin. I’m not sure how successful we were, but we worked hard trying to clean it off. It has been a cool damp summer, so the cabin was very green. Lunch followed (hot dogs, hamburgers and salads) and a short chat with Dave before he headed back to the work site. Jim and I decided to go to a motel and get cleaned up, so we drove to Saugherties, detoured around a town festival, and got a room at Howard Johnson’s. I enjoyed the AT weekend, especially talking to the thruhikers, but also talking to Dave, Mark, Strider, Chuck, Tim, Larry, etc. Doing the work was also a good experience. I’ve always enjoyed giving back to the trail, though my back doesn’t much appreciate it. In the past few weeks, we’ve spent more time on the Appalachian Trail than we have in years. It has been fun to see the familiar places. Jim: In a way, it's been a good couple weeks. It's been a long time since I spent any time in this area and that was under very different circumstances. We've been discovering places and attractions that weren't available 25 or 30 years ago. Not to mention that we've changed and appreciate those things more now. After the meniscus surgery and recovery it was too late to get back on the PCT this year - at least if we expected to finish. There would have been a 2 month hole in the hike. So the hope is that we'll be able (and willing) to go back and hike it next year. Funny thing - the surgeon was almost as disappointed as we were. The big disappointment has been the toes that are keeping me from any real hiking. Not sure what can be done about that, but I think I'm gonna have to bite the bullet and see a doctor.